Oxon Hill, Md.- Retired astronaut Buzz Aldrin received a standing ovation at CPAC on Thursday, speaking "not as a Republican" or as a Democrat, but as someone who is concerned that America needs to maintain its space exploration program. Taking the stage to Kenny Loggins' song Danger Zone, Aldrin cut to the chase and began to discuss how America should be focusing on exploring the planet of Mars. 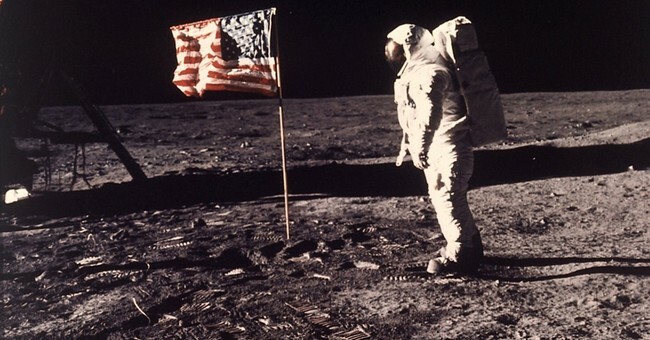 The bulk of Aldrin's speech focused on the need to colonize Mars, and suggested that this could be done as early as 2030. Aldrin described details of exactly how humans could settle Mars, and challenged the next president to have courage and to continue to advance science. "I salute those with the courage to lead this great nation. Lead it forwards to the next advances, which is our destiny. As Ronald Reagan said, we Americans have a rendezvous with destiny. Let's go for it!" Aldrin was incredibly well received by an audience that was somewhat starstruck to be in the same room as a man who had walked on the moon. Buzz Aldrin entering (and exiting) to 'Danger Zone' by Kenny Loggins is the high point of #CPAC. Pack it up, nothing will top it.